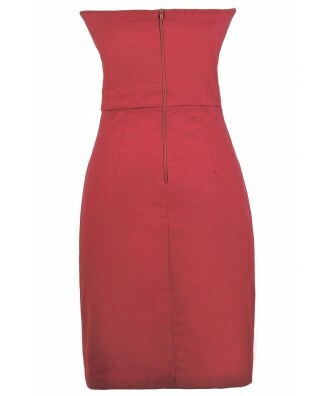 This sleek and chic cocktail dress has a great fitted cut. The Above The Fold Wine Cocktail Dress is made of a substantial fabric with a bit of stretch to it. It has a strapless neckline and lightly padded bust for support. 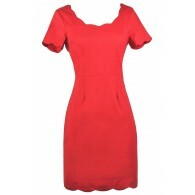 We love the curve-hugging fitted shape of this dress, the banded empire waist, and the pintuck fabric detail at the top. A zipper in the back completes this look. 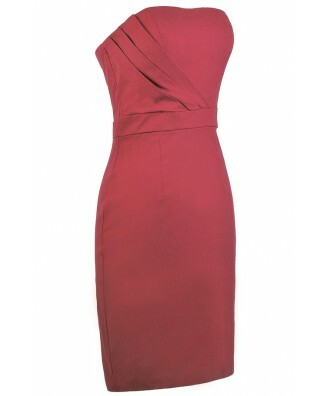 The Above The Fold Wine Cocktail Dress is perfect for your next date night out with someone special! This would make a cute Valentine's Day Dress. Pair it with black or beige pumps, a clutch, and some pretty jewelry! Details: Made in USA. Lined and lightly padded bust. Back zipper. 75% rayon, 21% nylon, 4% spandex. Hand wash cold or dry clean. Small measurements: Length from top of bust to hemline: 30". Bust: 32". 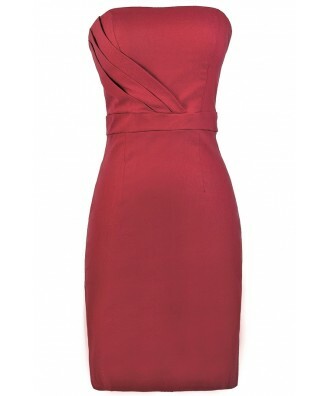 You have added Above The Fold Wine Cocktail Dress into Wishlist. You have added Above The Fold Wine Cocktail Dress for Stock Notification. You have set Above The Fold Wine Cocktail Dress as a loved product. You have removed Above The Fold Wine Cocktail Dress as a loved product.